Technologies that are supposed to promote collective learning and convenient acquisition of skills and knowledge unfortunately also cause certain issues. This book will help organizational leaders build an efficient and effective virtual community of practice. 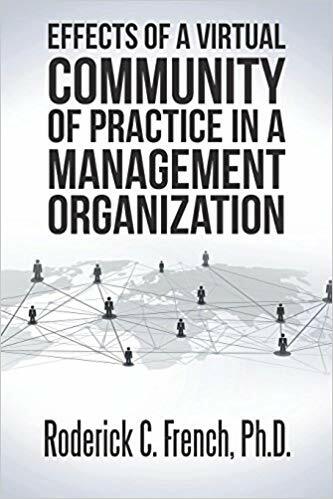 Dr. Roderick C. French, a professor in management and expert in staffing, performance management, and leadership, published his book “Effects of a Virtual Community of Practice in a Management Organization” (Xlibris, 2016). The purpose of his book is to provide insights into the organizational effectiveness of a virtual community of practice in an organization, in which members, due to their large number, typically do not know each other and interact through the use of computers. “Effects of a Virtual Community of Practice in a Management Organization,” which was the author’s dissertation for a Ph.D. in management, tackles the quality of communication in virtual communities of practice. Technological innovations such as local area networks (LANs), wide area networks (WANs), and the Internet promote collective learning and faster and easier acquisition of new skills and knowledge. Email, text messaging, instant messaging (IM), and social media offer ease and convenience of communication. However, these tools, due to their nature of use, promote an atmosphere of limited face-to-face interaction, thus opening the floodgates of communication issues. “Communication problems in new virtual communities with limited face-to-face contact have resulted in a high failure rate in terms of usability and adoption,” said Dr. French. The use of such tools has changed the way employees communicate and handle information. However, it also led to poor quality of online data, which causes failures of communication. “In general, researchers have considered the quality of communication in virtual settings as inferior to more traditional organizational communication,” said the author. Dr. French hopes that his book “Effects of a Virtual Community of Practice in a Management Organization” will help leaders gain a deeper understanding of the uses of virtual communication in the organization and, above all, help virtual communities boost their efficiency, improve collaboration strategies, and maximize their virtual communication tools. Watch out for Dr. Roderick C. French’s “Effects of a Virtual Community of Practice in a Management Organization” at the upcoming 2018 Frankfurt International Book Fair on Oct. 10 to 14, 2018. Written by Roderick C. French, Ph.D.
Dr. Roderick C. French is a dynamic, disciplined, and inspirational leader whose breadth of experience has garnered him the respect of those he leads, serves, and educates. His determination to be effective and efficient in his academic and professional life has allowed him to innovate, improve, and excel. Informed by over two decades of experience in the United States Marine Corps (1979–1999), Dr. French acquired insight into the important interplay of psychology, leadership, and management. His Marine experiences and his desire to learn inspired him to pursue, upon retiring from the Marine Corps, numerous degrees, including a bachelor’s degree in psychology from Campbell University (1998), a master’s degree in management from Webster University (2000), and a PhD in management from Walden University (2013). Consequently, he has found a growing demand in the marketplace for his skills as an executive coach who specializes in organizational effectiveness. Demand for his guidance in areas related to engaging and increasing the effectiveness of transgenerational virtual employees has garnered particular favor with twenty-first-century businesses.